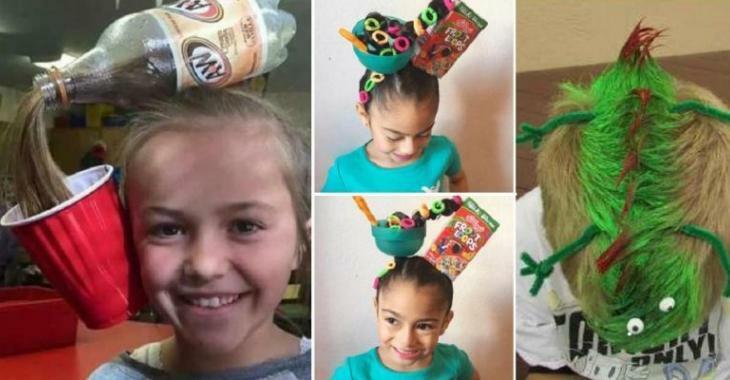 Crafts : 13 Hilarious hairstyles for kids, perfect for Halloween! 13 Hilarious hairstyles for kids, perfect for Halloween! Here are 13 fun hairstyles to do for Halloween! Do you like to create original stuff for Halloween or whatever party? Do you like to stand out? And do your kids like to get into the game? Try one of these hairstyles for Halloween this year! Maybe even one of these hairstyles will match with your child's costume! Easy to do! A plate of cardboard, a bun, some felt and sweets! See the 3 small strips of felt under the donut to be able to pass Bobby pins in the hair on the picture #6. Make a pony tail to your child, pierce a bottle of soda and pass the pony tail in the bottle. Maybe pierce a plastic glass and cover the hole's outline with hot glue so it does not to injure the child's ear. Hold the glass in the child's hair. Get some color bombs for your hair! It's HALLOWEEN! With Christmas LED lights and a star made of cardboard! ADORABLE! Make small mermaids in cardboard! For what we callBad Hair Day! These days when there is NOTHING to do with our hair! WOW! Make several small braids by adding yellow ribbons or wool and put everything together in a big bun on the top of the head! Then paste paper bees on white pipe cleaners! Spray a green bomb on the child's hair and poke artificial roses everywhere! Add a small miniature fence around the garden and add butterflies flying over the garden with wire. Stick plastic figurines on hairpins with hot glue or E6000 glue. And color all hair in green with a hair spray. A lizard in the hair! My favorite! With a green colored Mohawk, pass two green pipe cleaners through the Mohawk and roll up the ends of the pipe cleaners to make the legs, then color red tips of hair. Just stick small eyes on 2 Bobby Pins with a hot glue gun or E6000 glue and slide them on the front of the head, same thing for the tongue, stick a little piece of red felt on a Bobby Pin. Stick a shark and a plastic surfer on hair clips and spray the hair with a blue bomb spray after modeling them into a big wave shape with strong gel.